PARIS (Reuters) - Opposition leaders accused French Interior Minister Christophe Castaner, an ally of President Emmanuel Macron, of incompetence after he said on Tuesday he was unaware of policing decisions made during rioting on the Champs Elysees. After another flare-up of violence in Saturday's yellow vest protest, which left the landmark Paris avenue looking like a battleground, calls for heads to roll have grown in France, despite its traditional tolerance for street protests. Rioters set fire to a bank and ransacked stores. Prime Minister Edouard Philippe sacked Paris police chief Michel Delpuech on Monday and two other officials, his chief of staff Pierre Gaudin and Frederic Dupuch of the local police force, a police source said on Tuesday. But politicians piled pressure on Castaner who has been in the job for five months. He was booed in parliament on Tuesday, before an expected grilling from lawmakers. "The Paris police chief is only a fall guy supposed to cover for Castaner's blatant incompetence," Jordan Bardella, far-right Marine Le Pen's candidate for European elections said on Twitter. Castaner faced criticism from opposition politicians after a video of him dancing in a trendy Paris nightclub on the night of the violence surfaced in French media. 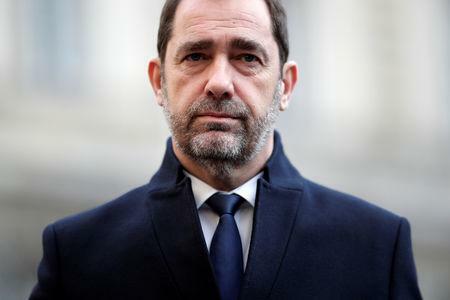 Castaner told French radio a tougher police approach, decided after rioters looted shops on the Champs Elysees in early December, had not been applied on March 16 as he had ordered. He said he was only made aware that senior police officials had instructed their teams on the ground to hold back on using flash-balls when he visited a police station near the Champs Elysees on Sunday. France has long taken a tolerant approach to protests, farmers have poured manure in front of ministries and trade unions have held creative demonstrations. But the violent, balaclava-clad protesters among the yellow vest demonstrators for such a sustained period has forced the government to introduce increasingly tough policing tactics. This month, United Nations human rights chief Michelle Bachelet called for an investigation into the possible excessive use of force by police during the protests, adding to criticism from the European Parliament and national human rights bodies. This criticism had contributed to "inhibiting" police ranks, Castaner suggested. "There was a form of inhibition. Some officials in the hierarchy, some police officers have doubts. Such doubt is not acceptable when you're faced with ultra-violent behavior," Castaner said. Macron's office and Castaner denied French media reports that the president had threatened to fire his minister. What began as a movement against a since-scrapped fuel tax hike and the high cost of living, the yellow vest protests have become a broader movement against Macron, his reforms and elitism. Even before Saturday's destruction, insurance companies had registered 170 million euros of damage since the start of the yellow vest weekly marches in mid-November.